The reigning champions Bengaluru FC ground out a hard fought 2-0 win over I-League newcomers Chennai City FC at the Kanteerava stadium in Bengaluru on Saturday. Goals from debutant Roby Norales and fan favourite CK Vineeth saw Albert Roca’s side make it two wins from two in the I-League. Roca dropped Cameron Watson in favour of Mandar Rao Desai as he looked to exploit the wings of the opposition. The Spaniard asked his team to play a 3-1-3-3 while going forward, but dropping back into a 4-2-3-1 while defending. Lenny Rodrigues dropped back into defence while Ralte and Khabra pushed forward. 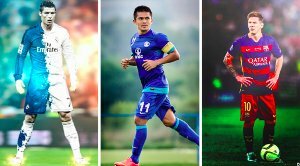 Eugeneson Lyngdoh dropped deep into midfield to influence play while Mandar and Udanta acted as inside forwards to support Sunil Chhetri and Daniel Lalrempuia. 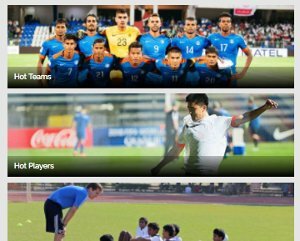 Robin Raja on the other hand decided to take the game to Bengaluru with a 4-4-2 system with U-22 player Prashanth Karuthadathkuni looking to provide the width and supply an extremely physical front two in Charles d’Souza and the gigantic Marcos Tank. It was the home side however, which got into the game quickest as early as the 10th minute. Juanan’s cross field pass was headed over the bar by an on-rushing Udanta. The Chennai defence was under siege within the next two minutes as Mandar’s chip from the left was headed into the box by Udanta where Daniel’s shot was saved by Karanjit. Bengaluru had the better of their southern opponents, but were unable to keep the ball on target. Chennai had their first sight of goal when Dhanpal Ganesh’s shot was easily saved by Amrinder. Some neat interplay between Daniel and Chhetri saw the captain through on goal but was denied by a superb tackle from Echezona Anyichie. The attack saw Robin Raja immediately call his two strikers and captain Dharmaraj Ravanan for a quick conference no doubt to find a way to get his attack into the game. Chhetri was through on goal yet again immediately, but custodian Karanjit pulled off another vital save to keep the scores level. 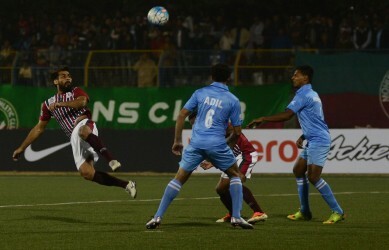 Chennai captain Ravanan almost was made to pay for his indecision as he was outmuscled by Udanta whose subsequent low cross into the area was beaten away by Karanjit. Chennai’s Prashant had the better of Ralte on many an occasion and his cross was headed away by John Johnson. Chennai looked like they were slowly inching into the game when Marcos Tank received a pass from Charles and beat his marker for pace but could not keep his shot on target. The second half started with less pace compared to the first as Chennai looked to restrict spaces between the lines and hit the Blues on the counter. Bengaluru on the other hand were struggling to finish off their chances. Robin Raja hauled off Marcos Tank just after half time and brought on midfielder Michael Rejin to further reinforce the midfield. 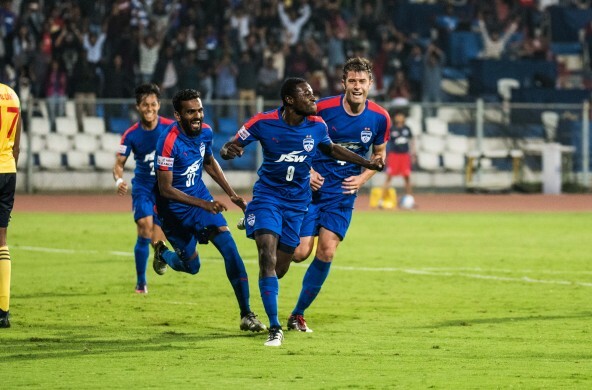 Bengaluru responded by giving striker Roby Norales his first appearance in a blue shirt. The change brought about the desired effect as the tall striker lashed home a botched clearance by the Chennai defence from a Harmanjot Khabra free kick. The home side smelt blood and started laying siege to the Chennai goal and their efforts were paid immediately as CK Vineet volleyed home from a wonderful Udanta Singh cross. The home side were fully in control and brought on midfielder Malsawmzuala close out a hard fought win.